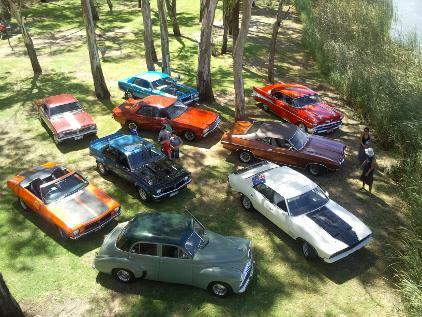 Mildura Muscle Car Club was formed in 2007 and has since acquired a membership of over 200 people. As a not for profit community group we focus on social events and car related activities, with a dedication to preserve and enjoy older cars. We welcome cars of interest, modified or traditional that are 25 years or older with a particular passion for cars from the "super car" era of the 60's and 70's. Does your pride and joy just sit in the shed most of the time? Drive it, don't hide it ! The club is based in Mildura and we welcome regional members. The Mildura Muscle Car Club also has access to Victorian and New South Wales Club Permit Schemes. The annual membership fee is $50 and all members are encouraged to attend monthly meetings which are held on the first Monday night of each month. Upon joining you will be issued with a members card which will be needed as verification for the Club Permit Scheme. You will also be given access to the Clubs Facebook page and receive Club newsletters every 3 months. An "Application for Membership" form can be downloaded from our "Membership" page or arranged by calling the Club Phone on 0429 908 160. After completion the "Application for Membership" form is to be brought to a meeting. We hope to see you at one of our cruises/events! Don't be too shy to bring your car along and be a part of a family friendly atmosphere. If you don't have your car on the road, or its not up to scratch yet feel free to bring your daily drive because we can still all get together to share our passion for older cars!